Recently, I asked the Null Byte community what subject they would most like me to cover in future tutorials. Many of you cited scripting, and I decided it's best to cover this subject soon, so here goes. Any self-respecting hacker must be able to script. For that matter, any self-respecting Linux administrator must be able to script. With the arrival of the Windows PowerShell, Windows administrators are increasingly required to script as well perform automated tasks and be more efficient. As a hacker, we often need to automate the use of multiple commands, sometimes from multiple tools. To become an elite hacker, you not only need to have advanced shell scripting skills, but also the ability to script in one of the widely-used scripting languages such as Ruby (Metasploit exploits are written in Ruby), Python (many hacking tools are Python scripts), or Perl (Perl is the best text manipulation scripting language). This is the first of a new series I'm starting in scripting. We will start with basic shell scripting, move to advanced shell scripting, and then to each of these scripting languages developing hacking tools as we go. Our ultimate goal will be to develop enough scripting skills to be able to develop our own exploits. 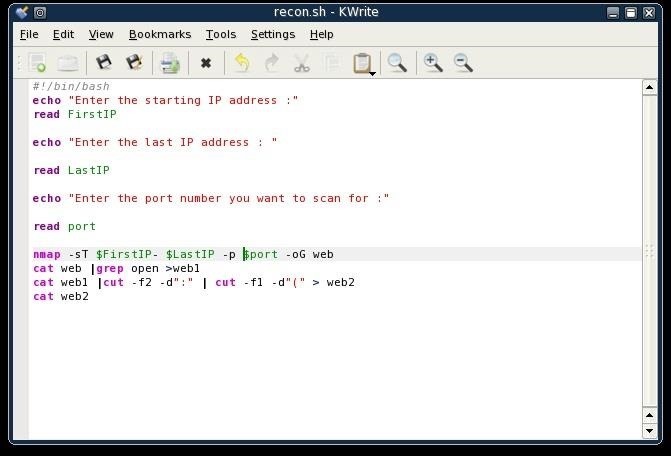 In a previous post, I showed you how to put together a simple script using nmap to scan a range of IP addresses to check for a particular port availability. We will need that script here, as we will be adding new functionality to it after completing some preliminaries. A shell is an interface between the user and the operating system. This enables us to run commands, programs, manipulate files, etc. There are a number of different shells available for Linux. These include the Korn shell, the Z shell, the C shell, and the Bourne again shell (or BASH). As the BASH shell is available on nearly all Linux and UNIX distributions (including Mac OS X, BackTrack, and Kali), we will be using the BASH shell, exclusively. To create a shell script, we need to start with a text editor. You can use any of the text editors in Linux including vi, vim, emacs, gedit, kate, etc., but I will be using kwrite here in these tutorials. Using a different editor should not make any difference in your script. Step 3: "Hello, Null Byte!" For our first script, we will start with a simple script that returns a message to the screen that says "Hello, Null Byte!". We start by entering the shebang or #!. This tells the operating system that whatever follows the shebang is the interpreter we want to use for our script. We then follow the shebang with /bin/bash indicating that we want the operating system to use the BASH shell interpreter. Next, we enter echo, a command in Linux that tells the system to simply repeat or "echo" back to our monitor (stdout) what follows. In this case, we want the system to echo back to us "Hello Null Byte!". Note that the text or message we want to "echo back" is in double quotation marks. Now, let's save this file as HelloNullByte and exit from our text editor. When we create a file, it's not necessarily executable, not even by us, the owner. Let's look at the permissions on our new file, by typing ls -l in our directory. Now when we do a long listing (ls -l) on the file, we can see that we have execute permissions. The ./ before the file name tells the system that we want to execute this script in the current directory. This means that if there is another file in another directory named HelloNullByte, please ignore it and run HelloNullByte in my current directory. When we then hit enter, our very simple script returns to our monitor. Success! We just completed our first simple script! So, now we have a simple script. All it does is echo back a message. If we want to create more advanced scripts we will likely want to add some variables. Variables are simply an area of storage where we can hold something in memory. That "something" might be some letters or words (strings) or numbers. It can help to add functionality to a script that has values that might change. Let's go back to the script we wrote to use nmap to scan for vulnerable machines with a particular port open. Remember, the famous hacker, Max Butler, used a similar script to find systems with the Aloha POS that he was able to hack for millions of credit card numbers. 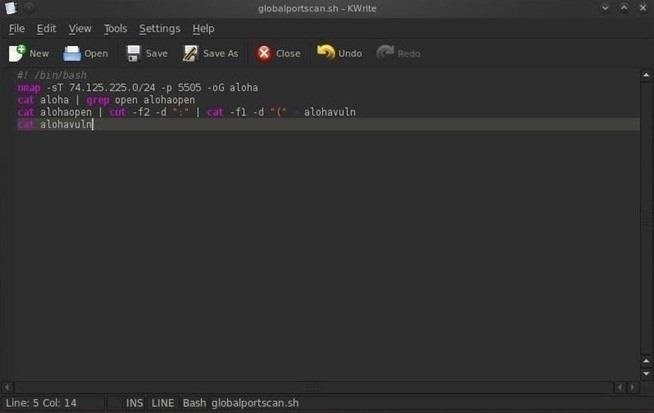 As you can see, this script was written to scan a range of IP addresses looking for port 5505 open (the port Aloha left open for tech support), and then create a report with all the IP addresses with this port open. The IP address range is "hard coded" into the script and can only be changed by opening and editing the script file. What if we wanted to alter this script so that it would prompt us or any user for the range IP addresses to scan and the port to look for? Wouldn't it be much easier to use if we were simply prompted for these values and they were then entered into the script? Let's take a look at how we could do that. First, we could replace the specified subnet with a IP range. We can do this with a variable called "FirstIP" and then a second variable named "LastIP" (the name of the variable is irrelevant, but best practice is to use a variable name that helps you remember what it holds). Next, we can replace the port number with a variable named "port". These variables will simply be storage areas to hold the info that the user will input before running the scan. Next, we need to prompt the user for these values. We can do this by using the echo command we learned above in writing the HelloNullByte script. So, we can simply echo the words "Enter the starting IP address :" and this will appear on the screen asking the user for the first IP address in their nmap scan. echo "Enter the starting IP address :"
Now, the user seeing this prompt on the screen, will enter the first IP address. We need a way then to capture that input from the user. We can do this by following the echo line with the read command followed by the name of the variable. The read command takes a value entered at the keyboard (stdin) and puts it into a variable that follows it. The above command will put the IP address entered by the user into the variable, FirstIP. Then we can use that value in FirstIP throughout our script. Of course, we can do the same for each of the variables by first prompting the user to enter the information and then using a read command to capture it. Now, as the script is written, it will scan an IP address range starting with FirstIP and ending with LastIP looking for the port the user input. Let's now save our script file and name it Scannerscript. Now we can run our simple scanner script with the variables that tell the script what IP address range and port to scan without having to edit the script. As you can see, the script prompts us for the first IP address, then the last IP address and the port we want to scan for. After collecting this info, it then does the nmap scan and produces a report of all the IP addresses in the range that have the port open that we specified. 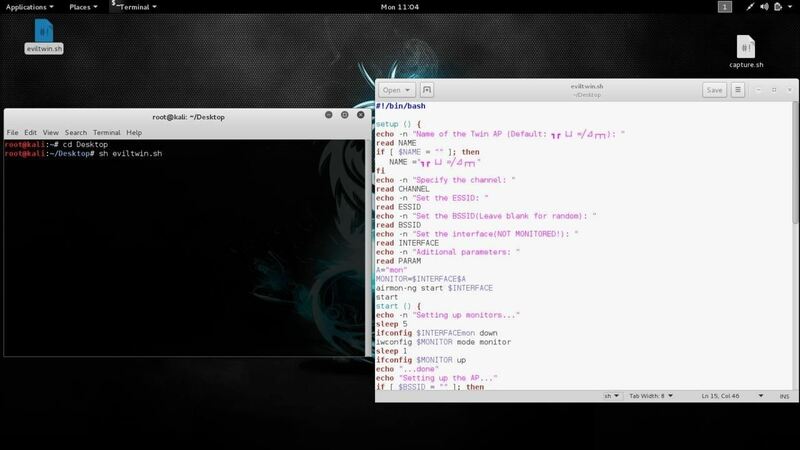 Make certain to save this script as we will return to it in future tutorials and add even more functionality to it as we learn more about shell scripting for hackers. not too much different from using python or ruby. and again, as clear as can be! thank you very much!!! Oh! I thought the shell was something different. Good tutorial though! Unfortunately, I don't know of any but many of the linux books for good scripting sections. It really depends upon the platform you decide to use. If you use a virtual machine, I recommend 8gb of RAM, but it will run on 4gb. Most of the hacks are not CPU intensive and BT/Kali only use about 3gb of hard drive. Thanks for that info OTW. What do wireless cards have to do with general hacking initiatives? Can you please throw some light there? Also is there any value to the power of a graphics card? . Don't most of Password Crackings apps works on graphics card,since it is capable of working on more data in less time? please comment on these points. Thanks. The wireless card necessary for wifi hacking. There is no value for hacking to have a powerful graphics card. GPU's can be used for password cracking and as you say, they are faster, but they certainly are not necessary. What sort of Hardware would be good for 1. Dual booted BT based system & 2. USB booted BT system? BackTrack is not that demanding on your hardware. Probably a dual core processor and 4gb of RAM would be good. You also may want an Alfa wireless card for wifi hacking. We will be getting to Ruby shortly, so keep coming back. Okay, I got the script written just like in the post, but when I run it it says "./Scannerscript: line 11: nmap: command not found"
This only works in BackTrack or other Linux distribution with nmap installed. What are you running, WalkingDude? That's OK. Just download nmap and your script will run. I do recommend that you install BackTrack as all the tools I use are in there. Cool. Thanks for the fast replies, too! BTW, welcome to Null Byte! I would suggest you start with my Linux series which as grown to 21 parts and with my "Hacking for Newbies". Even though it's completely off guide from here. Just a thought for you really. big fan of this site and OTW -- thank you for all of your excellent tutorials! Without going too crazy I took some of the suggestions of @appledash48 and @cyberhitchhiker for user confirmation, added a function to allow the user to correct mistakes, and added a few lines for cleaning up temp files and feedback. just a few simple suggestions that might be useful for other greenhorns.